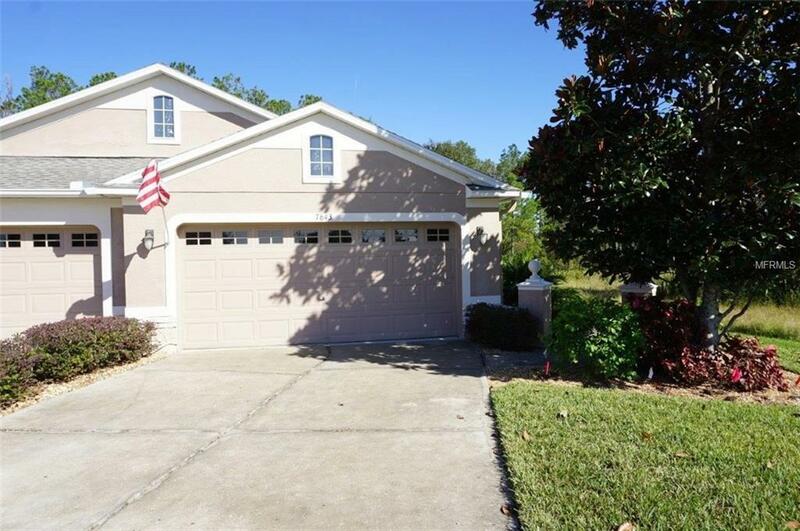 Beautiful single level Deerfields Villa in a gated area of Wilderness Lakes. Wood flooring and ceramic tile throughout. Solid granite kitchen counters, upgraded 42" cabinets, breakfast bar, stainless steel appliances, and tile backsplash. Open floorplan with living/dining combination, split bedrooms, and separate breakfast nook. Spacious master suite features sitting room, double-sink vanity with solid surface top, dual-head tile-surround walk-in shower, and two closets. New A/C installed 1-1/2 yrs ago. Refrigerator only 1-year old. Surround sound system, ceiling fans, crown moulding. Three solar tube sunlights brighten this lovely home. Enjoy outdoor living from the extended, fully covered screened and tiled lanai overlooking conservation and pond. Large end-of-street cul-de-sac lot with mature landscaping offers wonderful views and wildlife. Deerfields Villas have their own neighborhood pool. Bar in dining room does not convey. Wilderness Lakes is a master planned community with clubhouse, pools, tennis, fitness, and more. Buyer to verify all information and measurements.